You just never know what names you will find in vintage electronics magazines. 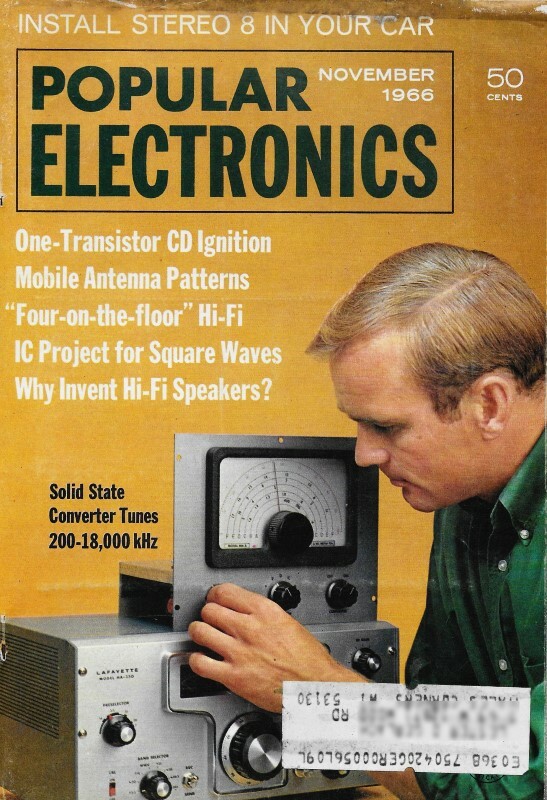 Incredibly - assuming of course that this is who it likely is - I ran across Steve Wozniak (aka "Woz"), later to be co−founder of Apple Computer, in this November 1966 issue of Popular Electronics. "Woz" first met Steve Jobs five years later in 1971 while working at Hewlett Packard. If this is "Woz," he, having been born in 1950, would have been a 16 year-old high schooler when his entry was published. The article does not specify who is responsible for which quote. Woz was a Ham radio guy, so maybe one of the Off the Air comments was from him. My favorite implausible comment from Sequel 2 is this one: "Don't waste money on 5 amp fuses - buy 15 or 20 amp fuses - they cost the same and you get more fuse for your money." BTW, I have to say that to some extent the comment about the meter with the longer needle being more accurate does have some validity. Assuming equal sensitivity and accuracy of each meter movement, a longer needle would allow a more precise interpolation along a more spread out scale. Since our last report in the September issue (page 81), we have received about 600 additional entries for the contest on nonsensical remarks about electronics. If you have not been following this contest, Popular Electronics is sending a soldering gun to every reader who submits a publishable "quote" that he or she has overheard. The "quote" must be a wild, inane, or implausible explanation of something electronic. Entries should, be addressed to: "Gun Contest," Popular Electronics, One Park Avenue, New York, N. Y, 10016. Postmarks will determine the winners of duplicate entries. Back to the Store. One reader writes that he overheard a little old lady explain to a clerk what was the matter with her defunct AM receiver in this way, "There's nothing too much wrong with it - if you plug it in, you'll see that the motor is still humming loudly, but the set won't talk." Another reader stood silently by while a dumbfounded clerk heard a customer tell his friend, "Don't waste money on 5 amp fuses - buy 15 or 20 amp fuses - they cost the same and you get more fuse for your money." In a hi-fi salon, a wife who expressed interest in a transistorized FM receiver but was perplexed by the term "solid state" was told by her husband, "Oh, that's the latest name those manufacturers are using for high fidelity." Off the Air. Hams and CB'ers have a lot of fun telling tales on one another. Last summer two CB'ers were comparing signal strength reports and one told the other, "Okay, your meter is probably right - a 3-inch meter is always better than a 2-inch meter because the needle is longer." And one prospective ham exclaimed on hearing his first SSB signal, "How in the world do they learn to talk like that?" The son of the father who made the following prize remark was probably left speechless by the irrefutable logic of "If that VOM reads infinity at full scale, then half-scale must be half of infinity." Winners. This month soldering guns went to Ralph Burbank, Tom Garrard, G. Linwood, Philip Taylor, and Steve Wozniak. More "quotes" and a new list of soldering gun winners next month.